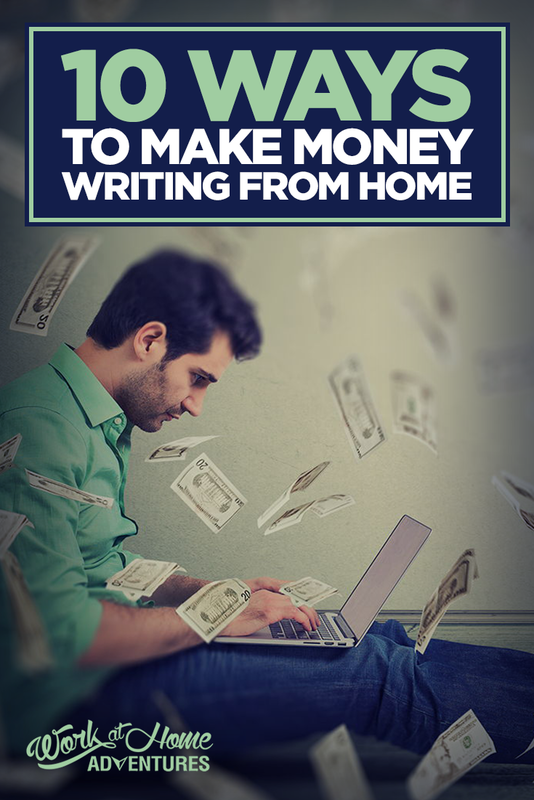 There are many ways you can make money writing from home. You’ll find a lot of posts that talk about specific companies, but I wanted to do a quick run-down on the most popular ways to make money writing from home, as well as some of the websites that provide these kinds of opportunities. In this post, I’ll cover writing for websites that provide article topics, writing articles on revenue share websites, applying for jobs through websites that provide job leads, starting a blog and writing an ebook. There are many of these types of websites, two in particular that have been reviewed on Work at Home Adventures are Textbroker and Article Document. Textbroker has been around for a while – I did some work for them when I first started doing freelance writing from home. I would only recommend this site to people who are new to freelance writing, I would not recommend it for people who have been writing for a while, because their rates are very low. You start by taking a test to determine what level you’re at – the higher your level, the more you’ll make. Each article you write is scored, and based on what your cumulative score is, your level could go up or down. 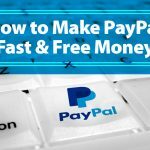 You need to make at least $10 before you can cash out, and they pay by Paypal. There are three different ways you can earn money with Article Document – by qualifying to write articles that have to do specific industries, writing articles as a ghost writer, and by sharing things on social media like coupons, announcements, and pieces of content. To qualify for industry qualification assignments, you have to choose the industry and industry segment you want to qualify for, and write a 500-word article on a topic of your choice that relates to that industry. A professional will evaluate your work, and you’ll receive a score between 0 and 10. Writers who receive a 9 or 10 will qualify to write articles for that industry – you can qualify in up to three different industries. Once you’ve qualified for a few industries, you’ll also be able to receive ghostwriting assignments. These assignments are written anonymously, so you won’t receive credit for the article. The pay rate starts at 3 or 4 cents per word, and goes up based on how many assignments you complete successfully. When you’re writing on revenue share websites, most of your income comes from page views, so it’s important to share your work as much as possible, and also to try to find out the types of posts that get the most views. Writing on revenue share websites is also a good way to drive traffic to other products you sell, such as eBooks – you just need to be careful that you don’t use too many affiliate links in your revenue share articles. For example, you can check out this hub I wrote about my favorite writing sites: http://hubpages.com/literature/My-Favorite-Writing-Sites. You make money on Hubpages through their Ad program, and you can also earn affiliate income with their Amazon and eBay programs, and also with Google Adsense earnings. One nice thing about this site is that you retain the rights to your work – that means you can publish there, as well as on other websites, including your own. In my opinion, writing on Hubpages is a good way for the beginning writer to earn how to write for the Internet, but not much else. You are not going to make a lot of money with this site unless you really work at it and publish several hubs a week. If you’re looking for a little more guidance, but still want the freedom to write about topics that interest you, Infobarrel may be a good choice for you. All you have to do to get started with Infobarrel is sign up. After you sign up an account manager will be assigned to you – the account manager will review your articles before they go live. You’re paid by Paypal once a month. I haven’t tried Infobarrel personally, but I haven’t heard good things about it – most people say that they don’t earn a whole lot with the site. Again, this may be a site that’s good to write on for experience, but not much else. 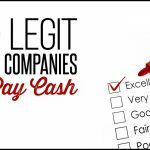 If you’re really looking to make a serious income from writing, and you have experience, this may be the best route to take – there are plenty of places where you can find writing job leads – two of my favorites are Problogger and Indeed. This site, owned by Darren Rowse, has a LOT of excellent content, as well as a list of current writing jobs. Some of the information you can find on this site includes blog posts that address issues that are important to bloggers, links to eBooks that have been written for the site, links to resources that are important for bloggers, and of course, a current list of writing jobs – most of them are freelance, but if there’s a specific location, it will be mentioned in the job posting. This site is not specific to freelance writing jobs or even work from home jobs, but it still has a lot of listings for freelance writing jobs. To find freelance writing jobs, just go to the website and type in keywords like “remote content writer” or “remote freelance writer” – when you’re looking at the listings, be sure to note whether the work can be done from anywhere, or if you have to live in a certain city – some remote jobs are only specific to certain cities or certain areas. If you apply for jobs through Indeed, you’ll want to create an account and upload your resume to their site – that way if there’s a job that comes up that matches the keywords for the job you’re looking for, all you have to do is submit your resume. Another way to make money writing from home is to start your own free blog on WordPress.com or blogger.com, or start your own self-hosted website. Blogger is owned by Google, so to use it you’ll need to create a Google account. The process is fairly simple though, just go to the Google Account creation page and follow the steps to create an account. Once you create your account, you’ll be able to access not only Blogger, but Google’s other services like Gmail and YouTube, among other things. After you’ve signed into your Google account, go to the google apps menu, which looks like a bunch of squares, and click “more” until you see Blogger. Click on the Blogger icon, and you’ll be taken to the Blogger dashboard. Click “New Blog” and follow the steps for creating a new blog. Another site you can start a free blog on is WordPress.com. Please note, this is different from WordPress.org, the official site for the WordPress platform that can be used on self-hosted websites – in order to do that, you need to purchase a domain through a hosting provider – you can find more information on how to do that here. To start a new blog on wordpress.com, go to the site and look at the different plans available – I recommend the free plan if you’re new to blogging. You can choose one of the paid plans, but if you do you’ll have to come up with some ideas for domain names, and of course there’s always the chance that your domain name will be taken. Regardless, you should come up with domain name ideas because even if you go with the free plan there’s always the chance that your wordpress.com domain name will be taken. After you’ve chosen a plan, you’ll go through the steps for setting up your account. There are a few different ways to make money with a blog. 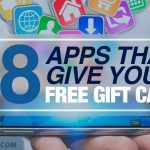 The two most popular ones are with Google Ads and affiliate marketing sites. You can make money from AdSense on blogger.com after your blog has been active for six months. However, if you start your own self-hosted website, you’ll be able to earn money from Google ads immediately by creating a Google Adsense account and putting ads in your blog posts and in other places on your site. However, if you start your own self-hosted website, you’ll be able to earn money from Google ads immediately by creating a Google Adsense account and putting ads in your blog posts and in other places on your site. Some affiliate marketing websites include Amazon Associates and Clickbank. 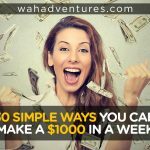 These are just some of the websites that provide ways to make money writing from home, there are many others. 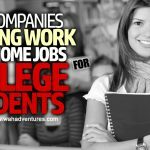 If you’re interested in earning money writing from home, be sure to check out some of the sites mentioned here, or do a search for others on Work at Home Adventures or on the Internet. Such an great post full of so many wonderful work from home bloggers! Thanks for sharing this. This is a very impressive and informative Post. 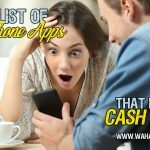 That’s a great list of resources to start earning money right away working from home. Particularly writing articles and earning revenues, is a great way for creative writers to earn money while perusing their passion. All this being said if you’re a fast writer, and you don’t spend a lot of time on each article, maybe you could make minimum wage working on Demand Studio stuff. Which would be cool if you’re working from home and that’s all the money you were looking for. But long-term, other “freelance” writing jobs would be likely to net you a lot more. Blogging is my favorite. I’ve done quite a bit of freelance writing, myself–not the website, but jobs you hunt down for yourself in corporate America–and the income can be excellent, but often requires a lot more personal marketing or a good list of personal contacts. And you’ll need to be able to prove you can do the work with a combination of references, education, and samples. You also need to have the good aptitude for customer service, so you can keep your clients happy.